LostLettermen.com is a college sports site that regular contributes to Dr. Saturday. Today it looks at the "Where's Waldo?" trend in college football. College football fans are a candid and funny bunch. Whether it's an Iowa State Cyclones' supporter hulking out of a pair of overalls, a female Longhorns fan swearing like a sailor or a portly NC State rooter losing his mind and his shirt, all are entertaining. The first book in the "Where's Waldo?" series (known as "Where's Wally?" in its home country of England and most other parts of the world) was published 25 years ago this past September. Six subsequent follow-up books were released between 1988 and 2009, sealing Waldo's reputation as a universally cherished character. The satisfaction of finding Waldo and his red-and-white striped shirt and hat among a huge crowd has entertained millions of children across the world. Have you ever met or heard of a person who said, "I hate Waldo"? We think not. So for intrepid college students who want to wear something other than a generic school T-shirt or other article of clothing in school colors to a football game, a Waldo costume has suddenly become en vogue in recent seasons. It's unique, immediately recognizable, and it has a much longer shelf life than passing fads such as the Green Man or giant blow-ups of people's faces. 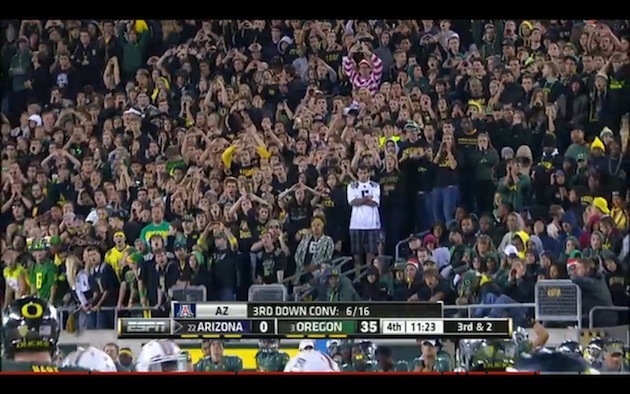 Thus far in 2012, we have been treated to Waldo sightings at Texas A&M, South Carolina, Oregon and Georgia and Iowa. There have surely been numerous others at games where there weren't national television cameras around. 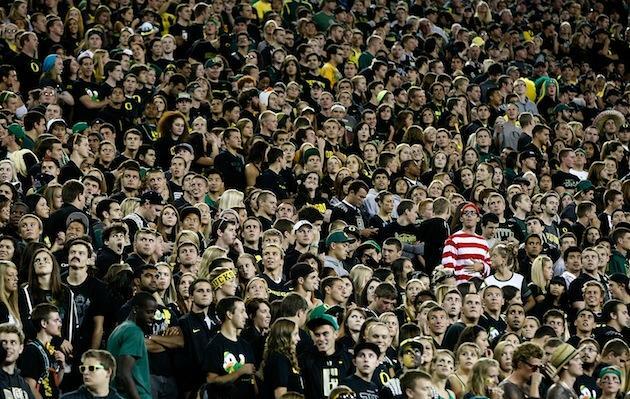 There have been Waldo sightings at other sporting events as well, but college students will always be more prone to dress like it's Halloween than adults for a sporting event. And Waldo's college football cameos couldn't have come at a better time. The New York-based licensing company that owns the rights to the character, Classic Media, has pegged 2012 as the start of a Waldo revival. He'll be a category on "Jeopardy!" this season. His trademark glasses and red-and-white striped shirt will be on sale. There's even a planned promotion in the sports world. A painting of the original "Where's Waldo?" 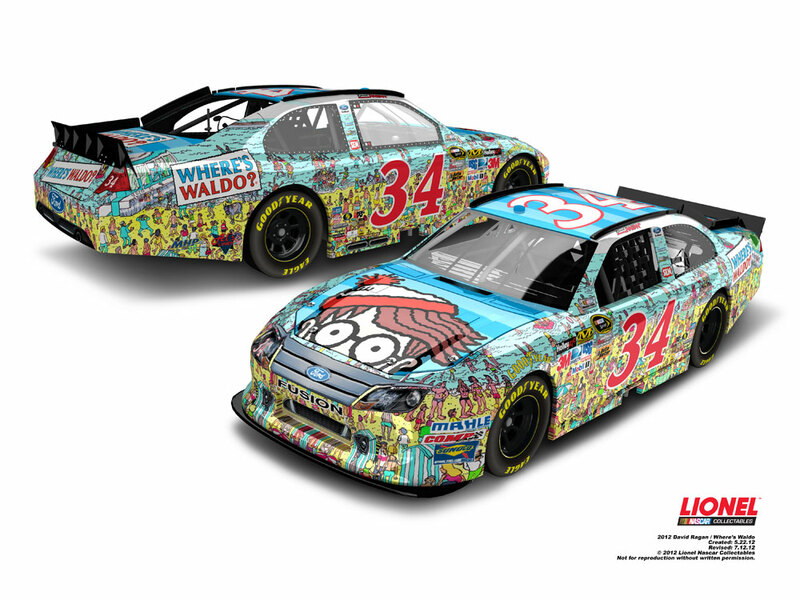 book cover will appear on NASCAR driver David Ragan's No. 34 Ford during the Tums Fast Relief 500 at Martinsville (Va.) Speedway on Oct. 28. 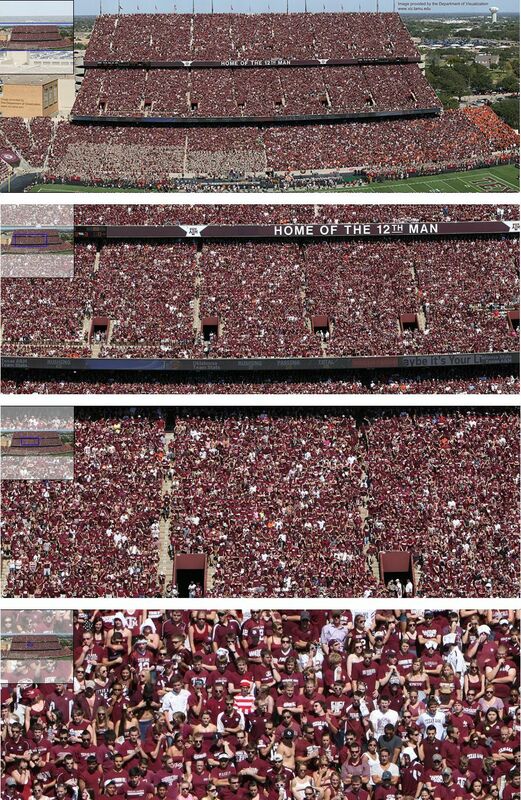 As for Waldo's emergence at college football games in recent years, how and when it exactly started is a bigger mystery than finding Waldo in each page of the book. 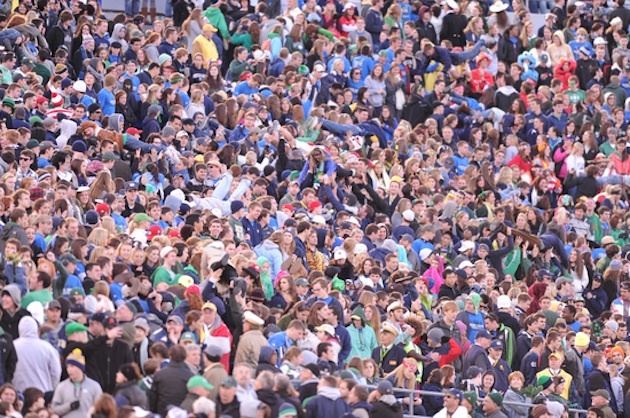 "From what I gather, it started with one guy just deciding to stand out in a crowd at one of those color-out games and somebody caught it on TV," said Examiner.com college football writer Kevin McGuire via email. "Then some random student decides to try it at any number of other locations." 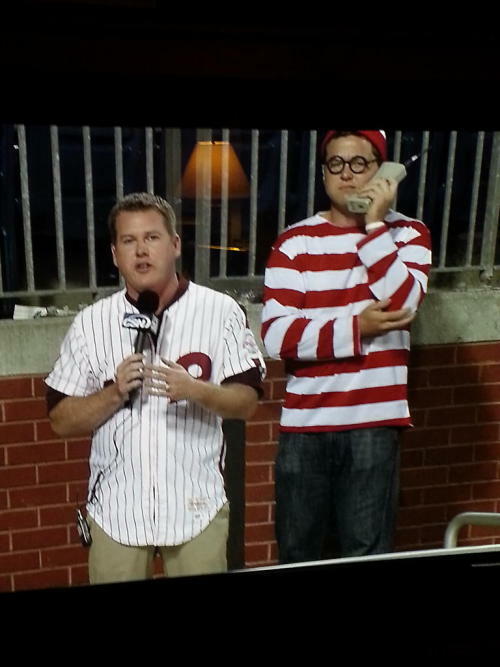 McGuire has started a Tumblr website called "Where's Waldo? Sports Edition" to track his sightings at college football games and other sporting events. The trend is hilariously ironic. 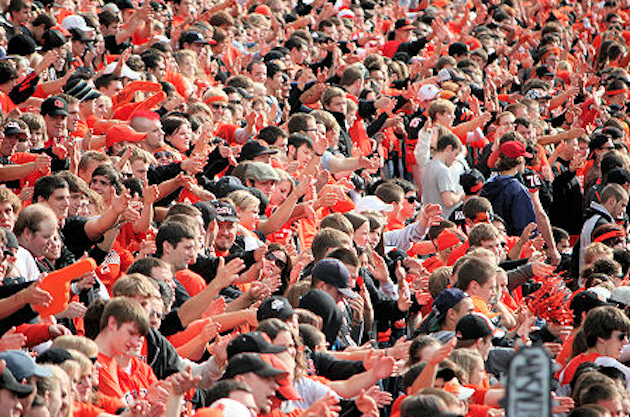 In order to stand out, a few brave college football fans are dressing up as a character best known for blending in. 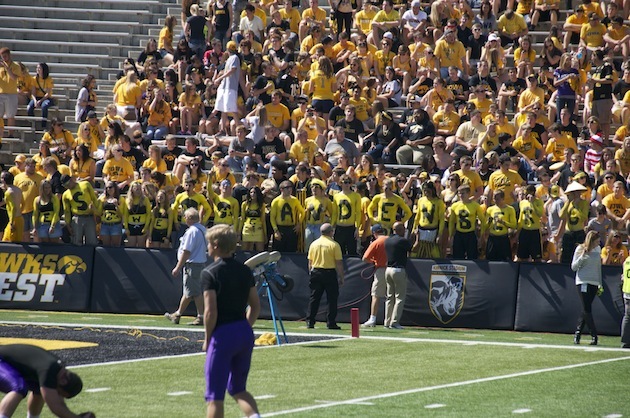 If the trend continues to spread like this, we wouldn't be surprised to see dozens of Waldos in a given student section or a "Waldo-out" for teams with red and white school colors like Wisconsin or Nebraska. 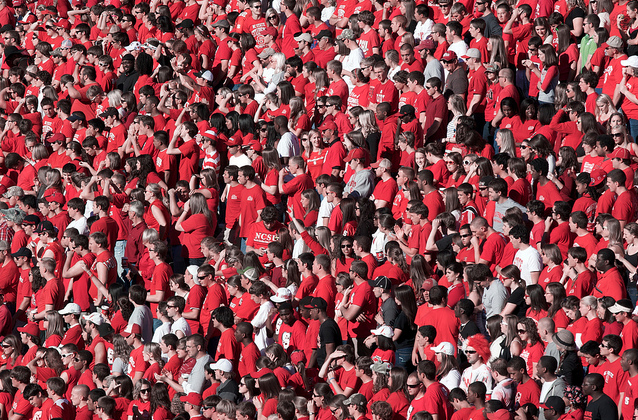 Are you like the rest of us and still find immense satisfaction in being able to locate Waldo in a dense crowd? 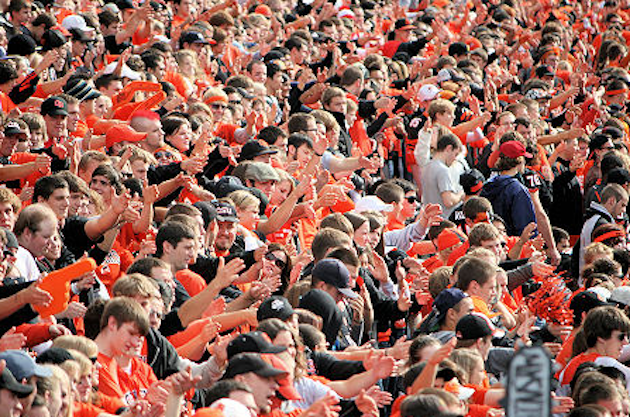 Peruse these photos of college football crowds to see if you can spot the mystery fan in each. Because although we all grow old, finding Waldo never does.